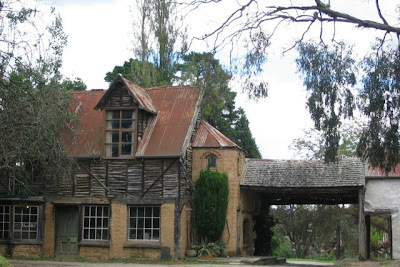 When I have had visitors from out of town, a favourite place to take them is the former artists’ colony at Monsalvat. 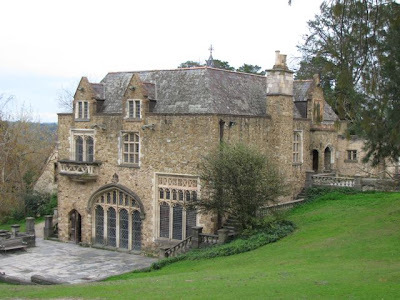 The beautiful Medieval-style buildings have olde worlde charm and artistic flair. (I am sorry my photos don't do it justice but I hope they will give a feel for the place.) 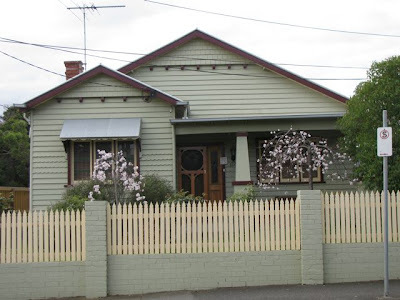 While they are not typical of Melbourne, the place gives an insight into the bohemian lifestyles of the mid 20th century. 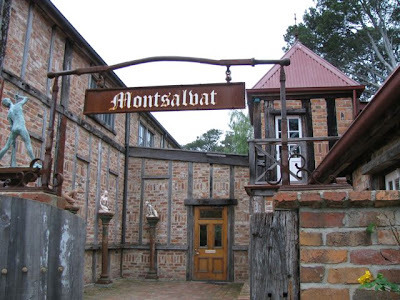 Monsalvat was the vision of artist, Justus Jorgensen, who established the artists’ colony it in the 1930s in Eltham on the Northern fringe of Melbourne. 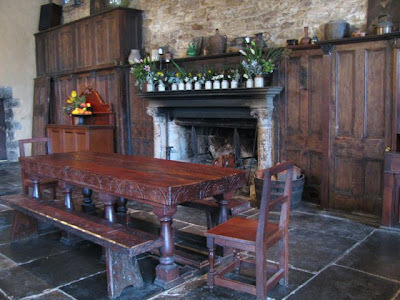 You can still view his paintings on display in the impressive Great Hall. 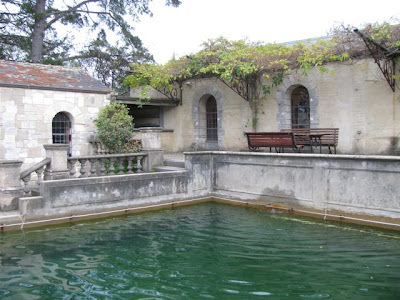 It is not hard to imagine bohemian gatherings around the ornamental pool on a summer evening. My dad has memories of visiting the colony when he was young and watching the artists at work. More fascinating this was where he had his brush with ‘fame’ as an extra in a film about the Christian Brothers. (What? You don’t know the film? Either do I!) 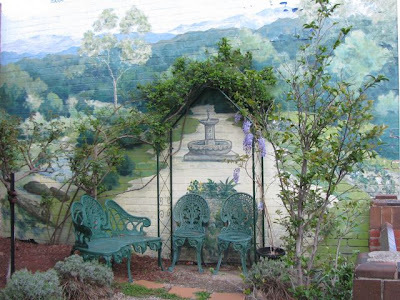 The artists’ cottages are reminiscent of a rustic French village, albeit with gum trees. Peacocks add an extra touch of romanticism. Today the public can view historic artwork and contemporary exhibitions in the Great Hall, the Barn Gallery and the Long Gallery. You can walk around admiring the buildings or enjoy a meal in the café. 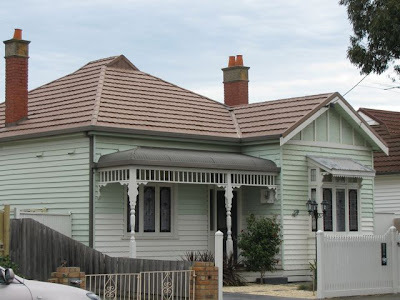 It is also a popular wedding venue with a small chapel (which I think I remember reading was moved here after being closed elsewhere in Melbourne) and banquet hall. Every now and then E and I like to visit Monsalvat. The beauty nourishes the soul. We always keep an eye out for the disposable camera my mother in law lost on a visit here. 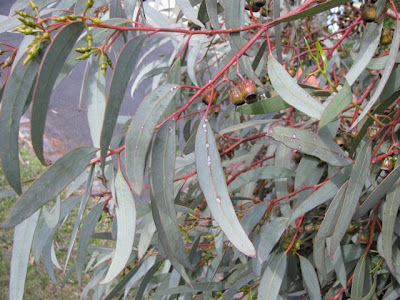 Please let me know if you see it – she lost her photo of Katie Koala. 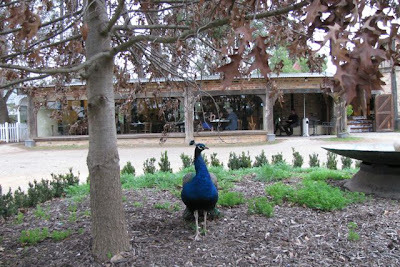 I also remember roaming the grounds with a teacher friend who spoke sternly to young boys who were chasing the peacocks. We all know it is bad luck to take a feather from the tail of a peacock. Much better to admire them. 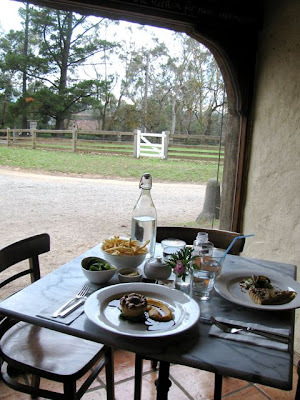 A visit is not complete without a meal at the café. 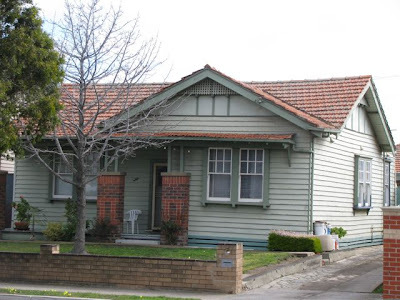 Like the rest of the buildings, it has a rustic charm with solid wooden beams, artwork on the walls and large windows. 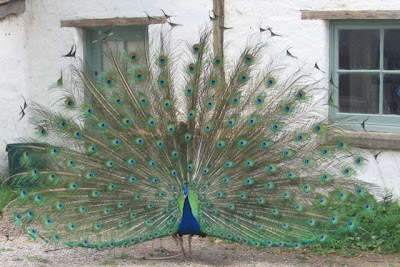 If you are lucky a peacock might strut by. The waiting staff are friendly and were very helpful on our last visit with finding a place for Sylvia’s pram. My memory of meals in the past are of a soup that the above teacher complained did not have enough salt and a fantastic dense chocolate cake. I’ll cope with an underseasoned soup if I can have excellent cake. The food was delicious on our most recent visit at the start of this winter when the cold weather is still a shock to the system. We needed warming up. The menu was a little posh and pricey. You can view it on the website (see link below) where it is described as ‘a modern interpretation of classical European cuisine’. It is interesting reading with tempting items such as cumin roasted baby beets or candied black olives. A menu to salivate and swither over. We decided to order entrees and side dishes. 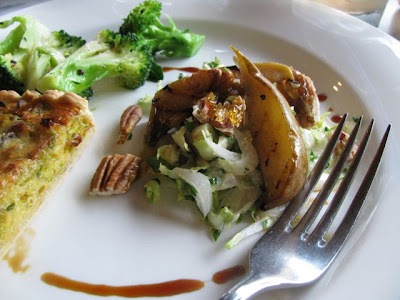 I ordered the blue brie and leek tart with grilled pear, whitlof salad and candied pecans. 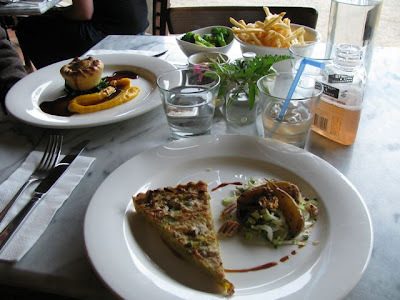 The tart was very light and tasty and the blue brie was not too overpowering as I had feared. I don’t think I have tasted whitlof before and it tasted frighteningly strong and bitter. Not at all a leaf I would usually eat. However, served in the salad with the sweet juicy pear and the crunchy candied pecans, it was lovely. E had a chicken pie with a pumpkin puree and a port jus. It was presented with great style. They were not huge servings but were enough with the delicious side orders of shoestring fries with aioli and steamed broccoli. We had a walk around the grounds after lunch. A bridal couple was being photographed in the Great Hall by the grand piano and chaise lounge, and the banquet hall was decorated for the wedding feast. We had to avoid a few steps with the pram and take it in turns to climb up the staircase in the Great Hall but I love wandering about those rustic buildings even on a grey wintery day. Both the café and the entrance fee are pricey so it is not a cheap day out but it has always been quiet and peaceful when I have been there. 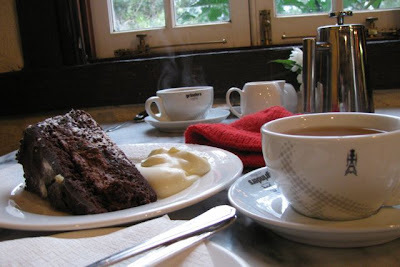 After our walk we returned to the café for a slice of chocolate cake and a cup of tea. The cake was lighter than the one I remember so fondly. We shared a generous slab, which was layered with cream and a rich chocolate icing, and was enjoyed by both of us. A fine afternoon tea and a fine end to our visit. Once upon a time in Australia, before we had heard of golden arches and shopping malls, burgers were bought at fish and chip shops. Our true-blue, dinky-di, you-beaut burger came with a charred patty of minced meat, lettuce, tomato, fried egg, fried onions beetroot and tomato sauce. It was ugly greasy and messy. 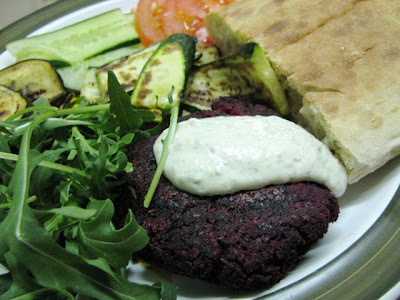 Or burgers were cooked on the barbecue and served with a garden salad, potato salad and beetroot. The beetroot came from a tin and was bound to fall on your lap but it was just part of life. These days a fortune is spent convincing us just how good burgers can look but as The Guardian illustrates, there is a huge gap between the advertising and the reality (more pics can be found here). I like my burgers messy and honest, which is probably why I still love beetroot with a burger. But I can do without beetroot in my lap. 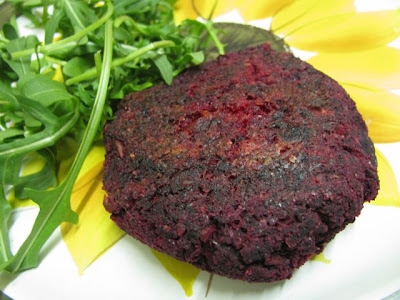 So I was delighted to see Susan’s Roasted Beet Tofu Burgers on Fat Free Vegan Kitchen last week. It seemed a great idea to put the beetroot in the burger rather than in a slippery slice on top of it. I went to the supermarket and bought the ingredients but forgot to check the quantities. Hence my changes to the burger started with much less tofu than Susan’s. Then I omitted onion, increased the garlic, forgot the smoked paprika, and found I didn’t need the salt. I also added purple corn flour. This is my newest discovery from last week’s excursion to WholeFoods. It is not a corn starch or a polenta but like a wheat flour made out of corn. I tried it in some dodgy crackers and it was gray rather than purple but I was undaunted. I thought it would go well in these burgers to make them a little darker but still contributing to the purple colour, without taking away any of their vegan, gluten free, nut free credibility. 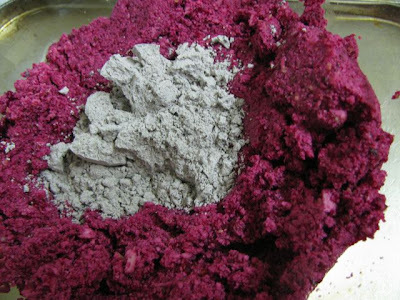 I am aware that not everyone is lucky enough to have this flour so I would advice trying other flours or even breadcrumbs if your pantry lacks purple corn flour. The burgers were delicious and were happily devoured. One burger each was enough for a dinner surrounded by a cheerful and varied spread of vegetables. The first night I served them with tomato, cucumber, fried eggplant, fried zucchini, rocket, pesto yoghurt and Turkish bread. 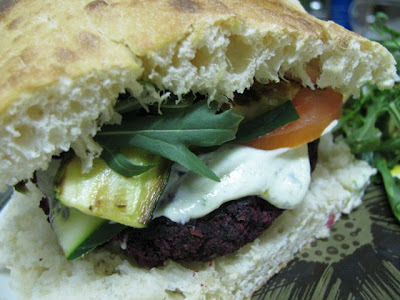 I piled my plateful between the slabs of Turkish bread and enjoyed a hearty messy burger. 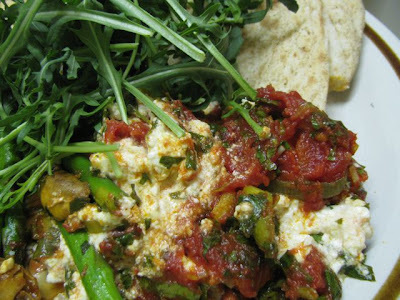 The next night we had tomato, cucumber, rocket, red pepper, broccoli, chutney and Turkish bread. These are not dense heavy burgers. They are light on calories and high on colour and nutrition. Just like all burgers should be. Preheat oven to 220 C. Wrap each beetroot separately in foil. Cut the top off the garlic and wrap in foil. Roast beetroot and garlic on tray in the oven. After about 30 minutes remove the garlic. Leave the beetroot in for another 20-40 minutes. 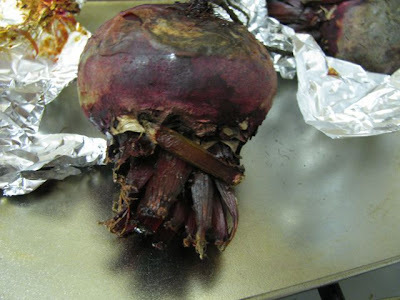 Check if cooked by using an oven mitt to squeeze the beetroot to see if it has softened. Once cooked, remove from oven and cool enough to handle. Meanwhile, place remaining ingredients in a food processor. Squeeze garlic cloves out of their skin. Trim ends off cooked beetroot and use your hands to rub the skin off. Add to food processor with other ingredients and blend to a smooth paste. Check seasoning and add a little extra flour (or breadcrumbs) if required. It will be quite soft. Line an oven tray with baking paper or grease well. 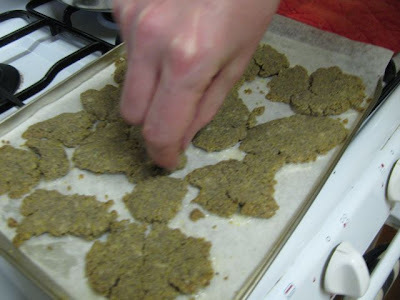 Take handfuls and shape into round burgers (it should make about 4-6 burgers) and place on prepared tray. Spray with oil. Bake at 180 C for about 40 minutes. Use an eggflip to turn over burgers midway through cooking and spray the other side with oil. They are ready when they have browned slightly and firmed up a little. Though not a great football fan, I do enjoy a Grand Final Spectacular. I had promised E I would make sausage rolls, which is traditional footy food (although you might have guessed that the vegetarian version is not usually the choice of most fans). 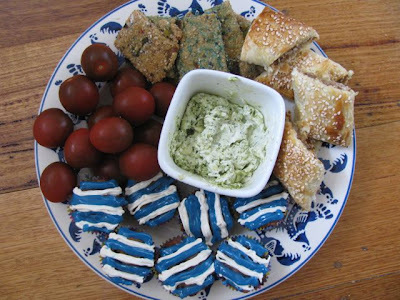 But last year I had waited till afterwards to make the blue and white food if they won. This year I decided I would make blue and white food no matter what. But blue is a difficult colour when it comes to food. I considered blueberries but in the end I turned to food colouring. I had a crazy idea that I would make dry biscuits or, as the Americans call them, crackers. The term ‘dry biscuits’ makes me think of dull hard eighteenth century ship food, so is not that appealing, although it is what we grew up with. The term ‘crackers’ makes me think of Woody Allen saying ‘are you crackers?’ Not that alluring either. But maybe I was crackers to want to make blue biscuits. I wasn’t quite sure which recipe to use. I had tried Kalyn’s Almond Cheese Crackers with my purple corn flour a few days previously and they were a dismal failure that looked like maps of obscure European countries. 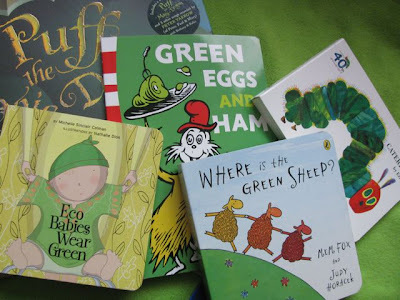 But strangely enough, E liked them. I didn’t have proper almond flour which is a dried version of almond meal (see Clotilde’s helpful explanation of nut flours – she also had some interesting recent cheese crackers) to try the crackers with the proper ingredients. 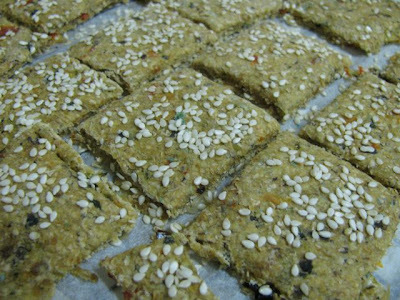 I didn’t have oat flour to try Cindy’s oat herb crackers, nor the food processor power to grind oats. When I got home from the shops, I saw that Yasmeen had just posted a recipe for Roasted Vegetable Crackers. 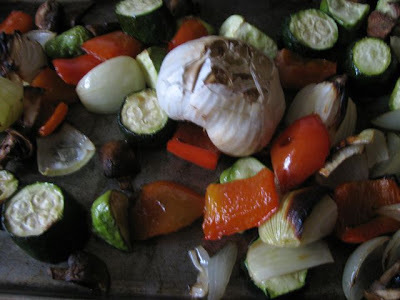 What an excellent idea to roast vegetables – which I love doing – and blend them with flour and just a little oil! I rustled up enough vegetables from the fridge to roast and made a half-hearted effort of kneading blue dye through half the dough. While the blue was not a success – I just didn’t have the will to use too much dye – the crackers were delicious and full of flavour. I was excited with my creation when E got home and he quite bemused me when he said they were tasteless. Meh to the Grim Eater, I say! We finally sat down with a platter of sausage rolls and tomato sauce, roasted vegetable crackers, pesto cream cheese and cherry tomatoes. The muffins were saved till half time. E also had some Wicked Elf Pilsner. All the food (and beer) were most pleasing and helped pass the time. 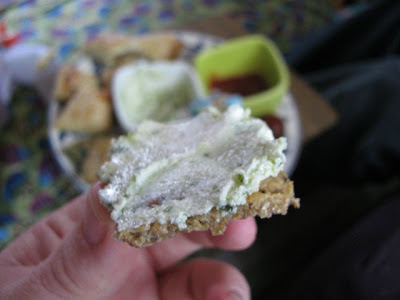 E found that the vegie crackers were actually quite tasty and especially good with pesto cream cheese. While once I could easily sit through a whole football match, now I find it hard to keep my concentration for that long. This afternoon, after a goal was scored by the opposition (St Kilda) after a Geelong player complained to the umpire I got a little tense and couldn’t bear to see another ‘mongrel kick’. 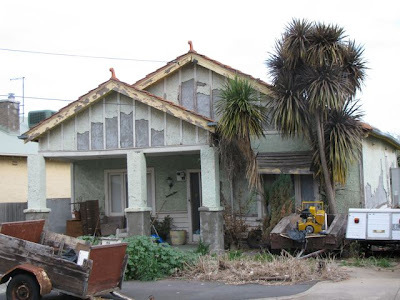 I started playing with Sylvia, taking rubbish to the bin and even invited a neighbour in for a chat. Suddenly we looked at the television and lots of Geelong players were hugging while the Saints were near tears. We looked at each other and said they must have won. (Either that or it was an amazing goal.) Sylvia practiced her hurrahs while we watched the gracious victory speeches and frenzied celebrations. I thought of those no longer with us who would have loved to see Geelong win - and those who are still with us like my brother Dave who is a die-hard supporter. The crackers too are winners. They were rather soft and chewy, especially after a day in an airtight container. More like unleavened bread. Maybe they were not thin enough as I baked them much longer than Yasmeen says (or it could be that I used a few too many veg as I used a few more than Yasmeen). I am still a novice at baking crackers but am quite keen to try more. I hope I will be making more of these because they are a healthy snack to have on hand. But no more blue biscuits. Finely chop all vegetables in a food processor (actually mine was more like a puree) and add flour, cayenne pepper and remaining tablespoon of oil. My food processor isn’t too powerful so I needed to tip it into a bowl to use my hands to knead the mixture into a smooth dough. The dough was quite soft and sticky. Divide the dough in to 2 portions. Lay a piece of baking paper on a flat surface and roll out one portion on the paper to a thin sheet. Use a little extra flour on the rolling pin and the dough to keep it from sticking. 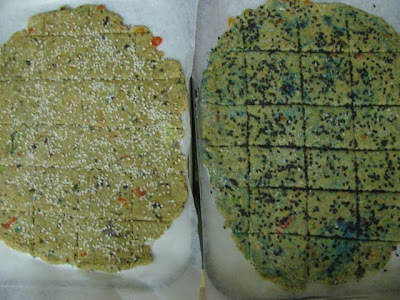 Transfer the dough on paper to a baking tray. Yasmeen suggested brushing with a little water and sprinkling with seeds - I didn’t brush with water and my seeds fell off - oops. I also found my seeds fell in the cuts made by the knife so next time I will sprinkle before I make any cuts. Use a sharp knife to cut squares in the dough but leave on the tray as one piece. She also pricked hers with a fork which I forgot to do but will do next time. Repeat with other portion of dough. Bake at 190 C for 15-25 minutes until they are light brown. Mine were in the oven for 25 minutes and still not crispy but Yasmeen suggests 15-18 minutes and be careful not to let them get too brown. Cool on a wire rack and then cut or break into squares along the knife marks. Great with cream cheese. 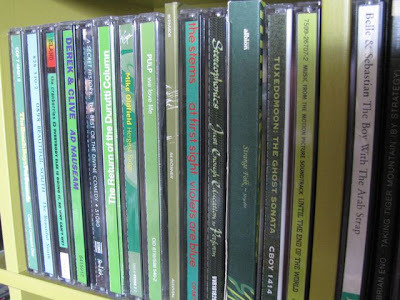 We have many green things in our home. 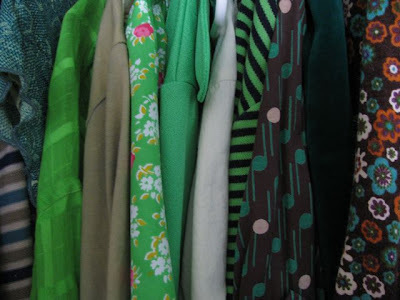 We even have green interior walls and a green front door. 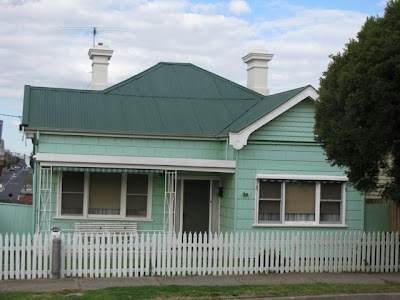 But while I was out walking with Sylvia I started wondering about having a house that was green on the outside. It had never occurred to me before, but time at home with a baby means I have too much time to think. Since I have started looking I have been amazed at how many green houses there are. 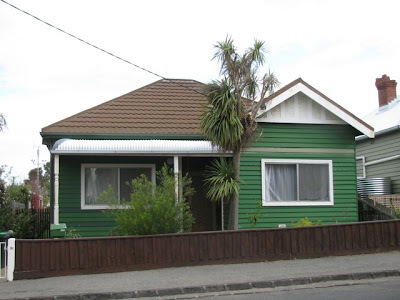 So to celebrate spring rains and new green growth, Sylvia’s first green vegetables (zucchini last week and broccoli this week) and a green meal, I give you a photo feast of green home and green houses. Well after that long excursion you are either a) curious to know where this is heading, b) waiting for a recipe, c) excited by all the green and longing for more, or d) procrastinating. So for those who have stayed the distance, I will now give you a recipe based on Heidi's Double Broccoli Quinoa. It caught my eye because it was full of lovely green broccoli. Mine wasn't the best because I accidentally over salted the quinoa and I suspect Heidi's cream might have been more liquid than my cream cheese. If I had been organised I might have served it with avocado but there were no ripe ones to be found. I've told you what I did but you are welcome to check out Heidi's superior dish, especially as her photos are always stunning. I added more green vegetables and it looked a gorgeous green. 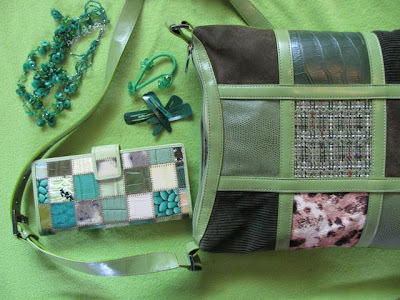 E said it needed red capsicum but I am only showing you the green version because that is today's theme. The best use of the broccoli pesto was in some polenta that I baked with mozzerella and topped with a tomato, lentil and pumpkin sauce but there were no photos - it would not do in a green post! Rinse quinoa (if necessary) and place in medium saucepan with 2 cups of water with a pinch or two of salt. (NB I forgot that the quinoa would soak up the water and thus the salt so mine was too salty – next time I will taste the water to check it is just salty enough.) Bring to the boil and simmer gently for 15 minutes until the quinoa is fluffy and soft. Most of the water will be absorbed but if there is any extra water, tip it out. Meanwhile, cook half broccoli in the microwave. Put one head of broccoli in the blender. Add almonds, parmesan, garlic, lemon juice, oil , cayenne and cream cheese. Blend to make a smooth puree. Cook the remaining broccoli, asparagus and peas in the microwave separately till tender and bright green. To assemble. Mix half the broccoli pesto into the cooked quinoa. Check seasoning – it may need more pesto, salt lemon, or cayenne pepper. Spoon quinoa into bowls. 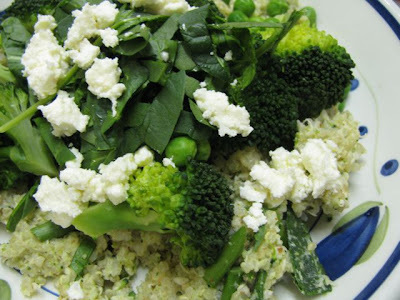 Arrange vegetables on quinoa and scatter with crumbled feta cheese. When we were young my mum would sometimes call me a ‘clever cookie’. Today I want to you tell you about a clever cookie. Ricki Heller is a fellow blogger who writes the wonderful Diet, Dessert and Dogs (which I have raved about before), and has recently produced a cookbook called Sweet Freedom. I have had my copy for a few weeks and already have made some of the wonderful sweet treats within. Sweet Freedom is subtitled ‘desserts you’ll love without wheat, eggs dairy or refined sugar’. Sounds virtuous and wholesome, doesn’t it? Don’t be fooled by Ricki’s healthy attitude to her sweet treats. She loves desserts and has spent many hours in the kitchen devising recipes that taste fantastic but are suitable for those with food allergies and intolerances. As well as vegan baking, there are many recipes for gluten free, nut free and soy free diets. I can highly recommend that book. 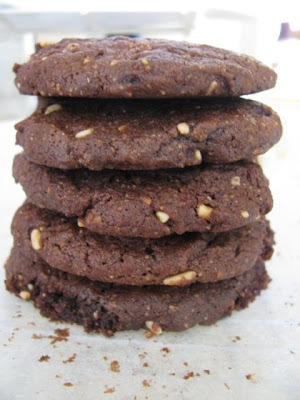 As a vegetarian I have no allergies and few limitations when it comes to baking but I do love an interesting recipe. From my first discovery of Ricki’s blog I have been delighted by her recipes, which have introduced me to new ingredients and diets without ever sacrificing any taste. In fact Ricki’s recipes are full of interesting textures and flavours. I have never been so keen on lots of eggs or dairy in baking so I find her alternatives liberating. You may be tempted to just stick to the blog rather than buy the book but I would encourage you to consider making the purchase. The book and the blog work together nicely. While Sweet Freedom doesn’t have lots of photos, the blog has many gorgeous photos and lots of entertaining and chatty introductions. But there are some really good advice in the introduction to the book and I love having all the recipes together in a book I can prop on my recipe holder rather than finding it on the computer each time. The index is fantastic. When I bought some barley flour on the weekend (partly because it is used a lot in the book) I was able to look it up in the index. And if you do have allergies or dietary restrictions, you will love the ideas in the book. But the proof is in the pudding, so to speak. Ricki has asked that her recipes in the book are not reproduced unless on her blog. Quite a few recipes are on her blog so it is easy to respect her wishes. 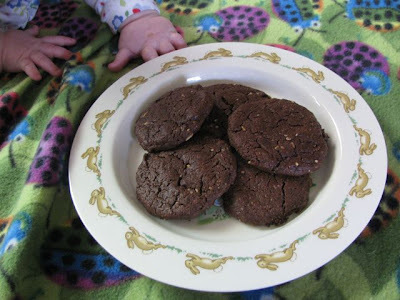 So I will tell you about the three cookies I have made from the book so far and share the recipe for Chocolate Peanut Butter Fudgies from the blog. As I said above, I love Ricki’s recipes for taste rather than dietary restrictions. So I find myself constantly making changes to the recipes to allow for what is in my pantry. I don’t always have the variety flours nor do I have sucanat (unrefined sugar) that Ricki uses a lot. So I haven’t managed to make one recipe from the book without some changes. The first recipe I made was the Coconut Macaroons. It was an evening a few weeks back when I had been out for meal at a pub with friends. My meal was very ordinary and I came home hungry for decent food. I had been planning to make the macaroons for a few days but I wanted chocolate. So I made the macaroons with a spoonful or two of cocoa powder. I was so happy when they came out of the oven. They tasted so delicious and got even better over the next day. 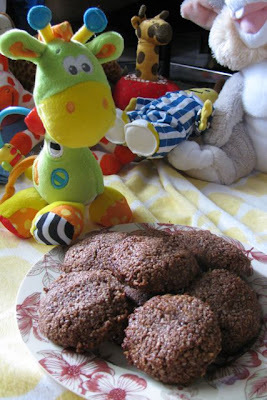 They were as chewy as any macaroons but a bit more substantial with the addition of almond meal as well as coconut. I would never have expected to be able to make macaroons without eggs and have them taste so good. 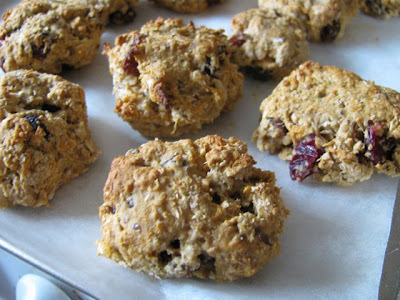 The next recipe I made was the Carrot Raisin Oatmeal Cookies last week. I made a few changes, some due to pantry limitations and some due to distraction. I used honey instead of maple syrup, wheat flour rather than spelt and I substituted cranberries for some of the sultanas (raisins). They reminded me a little of the rock cakes we had a lot as kids. When I told E they were carrot cookies he said you couldn’t really taste the carrot. But they were a little on the dry side the next day and, as I remembered racing about making the recipe while Sylvia grizzled, I realised I didn’t add any oil. Oops. They were still very good, so I imagine they would be excellent with oil. 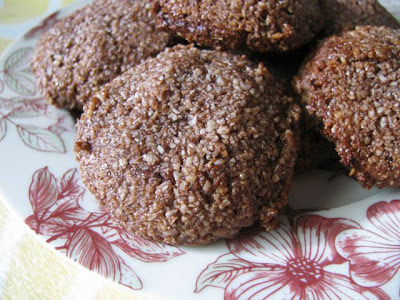 I made a few substitutions – wheat and barley flour instead of spelt, brown sugar instead of sucanat, and less vanilla essence. My only quibble with the recipe is that it called for eggplant puree without giving an indication of how much eggplant was needed or how to make it. I’ve never seen eggplant puree for sale here so made my own. I did a few other things that would earn Ricki's disapproval. 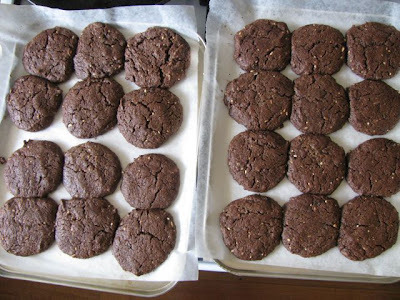 I was a bit lackadaisical with measurements - measuring sugar by weight and other ingredients by cups, and, as you will see in the photos, my cookies were too close together. The biscuits (or cookies) were delicious - rich, dark and very chocolatey. When they came out of the oven and cooled they were a little crisp on the outside and soft on the inside. I stored them in an airtight container and found they went soft in there but after a day or so they became a bit more chewy. On the night I made them, E told me they were very nice and he went back for another. Then last night I said I forgot to tell him the secret ingredient and asked him to guess. First guess was eggplant. I think he had sought the most unlikely and unappealing ingredient. His jaw dropped when I said yes. But it didn't stop him eating them. They are very moreish and the ones in the biscuit tin didn't last long. I am very happy to report that there are still some in the freezer. Oh joy! Even Sylvia wanted a taste. I am looking forward to more yumminess from Sweet Freedom. *I used 100g eggplant but next time would use a little more. I brought it to the boil, simmered it for 10 minutes, then drained it and sieved it. I pushed some of the water out through a sieve before I sieved it but ended up using some of this because I was a little under ⅓ a cup. 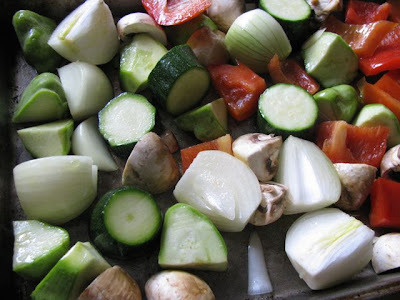 Alternately you may substitute another moisture-rich vegetable, such as cooked zucchini, or use unsweetened applesauce. Preheat oven to 190 C or 375 F. Grease or line a baking tray. 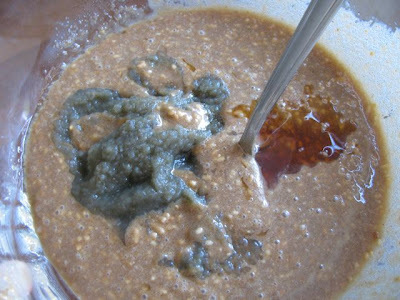 In a large bowl, cream the peanut butter, sugar and oil with a spoon. Stir in the maple syrup, vanilla, vinegar, and eggplant. Add the flour, cocoa, bicarb soda, baking powder, and salt. Stir to mix well. The dough will be quite sticky but barely hold its shape. Drop tablespoonfuls of dough on the prepared baking tray about 2 inches apart. 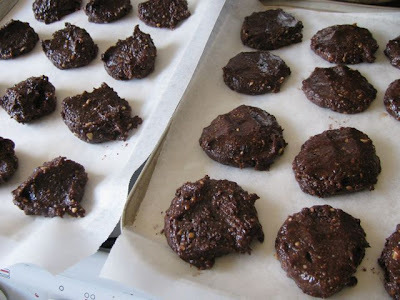 (They will spread - see photos of trays of uncooked cookies with one tray of flattened and one before being flattened, and the cookies once cooked.) Use a slightly wet hand to flatten slightly and shape if necessary. Bake for about 12 minutes, rotating pans halfway, until cookies are puffed and cracked on top. Cool biscuits on the tray. They will firm up as they cool and may be frozen. I have had a productive day. 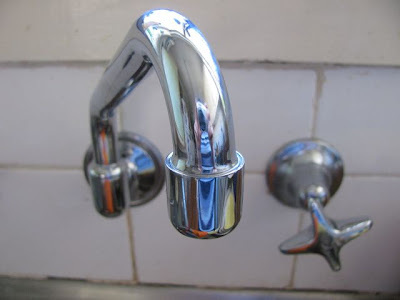 This morning I finally got the plumber over to install a shiny new tap that swings from side to side (rather than being fixed in place). I was so pleased I thought I could just sit feeling proud of myself for the rest of the day. But Sylvia decided to sleep for almost three hours this afternoon. 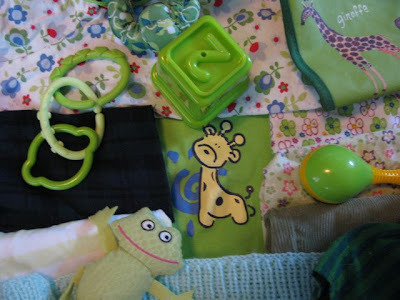 Such uninterrupted quiet calls for a little organization (before the inevitable evening with a sleepless baby). 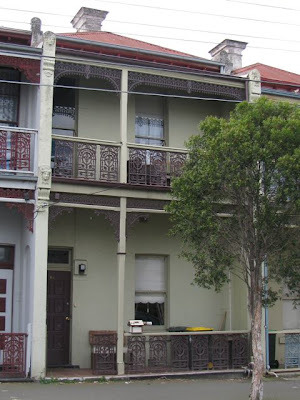 While she slept I hung out the washing on the line, made stock and potted a tomato plant I had been given. I have never potted plants by myself before but I was a bit worried about this one dying so I had a go and will check with my mum when she gets home to see if it is ok. I did some blog housekeeping and was inspired by my blog for ideas to make dinner tonight. I have a bunch of spring onions that I don’t want to get old and wrinkled so I have used some in a variation on Lentil Salad with Halloumi and Asparagus. I even made a fancy pizza for lunch. I bought some delicious pita bread yesterday and planned to make us pizza tonight but the pitas were already showing mould spots today so I thought I better use what I could salvage. I fried some eggplant with a bit of oil spray on my non stick frypan. 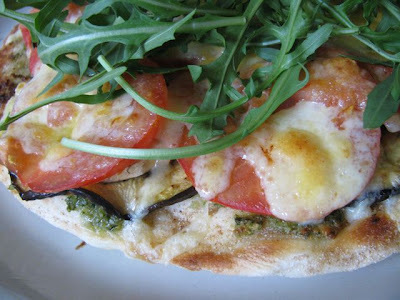 Then I put pesto, eggplant, mushrooms, tomato and cheese on top and grilled it. The pita bread was part of my bounty from a long walk down Brunswick way yesterday. I paid a visit to La Manna Fresh for last night’s dinner. I had seen a tomato and feta bake in a food magazine. 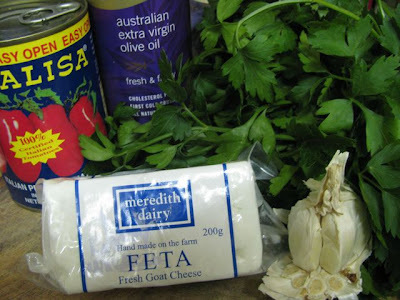 It called for 400g of feta cheese but at $10 for a packet of 200g I thought that one packet was enough. A handful of rocket and a bunch of asparagus was all that I needed to complete dinner. We just missed a train going home and had to sit waiting for another. As we waited, I spied a flash of white in Sylvia’s smiling mouth. Somehow her first tooth had come through with minimum of fuss. Although, maybe we can blame her unsettled sleep lately and red cheeks on the tooth. Last night's recipe was a good simple one for a night when I was tired out by the little rascal. I especially appreciate something easy when I need to ask E to help out. When I sat down to feed her I instructed E to stir in the herbs and pour into the casserole dish when the timer rang. Even he could do that, although he wasn’t sure what to do with the feta in the dish. I had forgot to tell him it had to be baked with the tomato sauce. I added spring onions because I had them in the fridge and I used parsley rather than oregano but I think any fresh herbs you fancy would do. E suggested adding olives. The bake didn’t look quite like in the picture but it tasted lovely with some sautéed asparagus, fresh rocket and warm pita bread. However, the below proportions between the two of us were ample with some pita bread because it was quite intense. E said half would have been enough. I am glad he liked it because I have already filed this in the mental list of recipes for a tired night. Preheat oven to 220 C. Heat olive oil in frypan over medium. Fry garlic for 30 second. Add tomatoes, bring to the boil, stir and then simmer for 15 minutes. Remove from heat and stir in herbs and spring onions. Crumble feta into a small casserole dish. Pour tomato sauce over feta and bake for 20 minutes until hot and bubbling.